The Achilles tendon connects the muscle group of the calf to the bone at the bottom of the foot or calcaneus. The tendinous portion of the muscle belly is what inserts onto the bone and this is called the Achilles tendon. 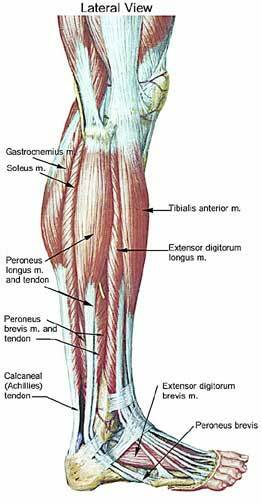 Underneath the large gastrocnemius or calf muscle is another muscle called the soleus. These muscles blend together to form a tendon which is actually called the Achilles tendon, which inserts onto the bottom of the foot bone or calcaneus. This large muscle is involved in repetitive use in day-to-day life. Especially in sporting activities, the Achilles tendon is subject to injury, where the foot is moved repetitively upwards and downward. If the pain is an acute problem, it may be tendonitis. Tendonitis is a condition where there is inflammation of the tendons where they insert onto the bone. This can be treated conservatively with anti-inflammatories, rest and decreased activity. More significant injuries can occur, such as a rupture of the Achilles tendon which renders the foot unable to effectively push downwards and results in extreme pain. Many patients with chronic pain involving the posterior aspect of the ankle who have been diagnosed with Achilles tendonitis actually suffer from a tendonosis. Tendonosis is actually a condition from chronic injury, where micro tears have occurred and are healed with scar tissue. This results in a haphazard formation of collagen that results in scarring. This is not normal healthy tissue and can lead ultimately to an Achilles tendon tear or degeneration of the foot joint. There is also bursa around the Achilles tendon which may become inflamed with chronic injuries as well. When there is a bursitis behind the Achilles tendon or retrocalcaneal bursitis and thickening at the Achilles tendon due to chronic inflammation, this is referred to as a Haglund’s deformity or “pump bumps.” This may also result in women from ill fitting shoes or wearing tight high heeled shoes for extended periods. When conservative measures have failed in the past, the use of corticosteroid injections when there is a tendonosis present may only further weaken the tissue and predispose it to rupture. An alternative treatment for Achilles tendonitis is the use of platelet-rich plasma (PRP) or stem cell therapy. Platelet-rich plasma (PRP) and stem cell therapy are regenerative medicine techniques that may help regenerate tissues that are chronically irritated and inflamed or undergoing degeneration or scarring. With platelet-rich plasma (PRP) therapy, the healing or growth factors in a person’s own blood are captured and injected into the injured area. This may help to heal and regenerate the damaged tissue. Additionally, stem cell technology may help regenerate damaged tissue. Stem cells can be processed from a person’s own fat cells or bone marrow. Once processed, the stem cells are directed into the injured tissue using a variety of techniques. Platelet-rich plasma and stem cell therapy are innovative and cutting-edge treatment techniques that may help repair chronic or acutely damaged tendon and muscle problems. If you continue to suffer with Achilles tendonitis and your current treatment plan leaves you wanting more options, perhaps a fresh set of experienced eyes can change your outlook. Since 1990, Dennis M. Lox, M.D has applied his personal interests in sports medicine, cutting-edge regenerative medicine and chronic pain management to helping patients increase their quality of life. Contact us for an appointment at 727-462-5582.